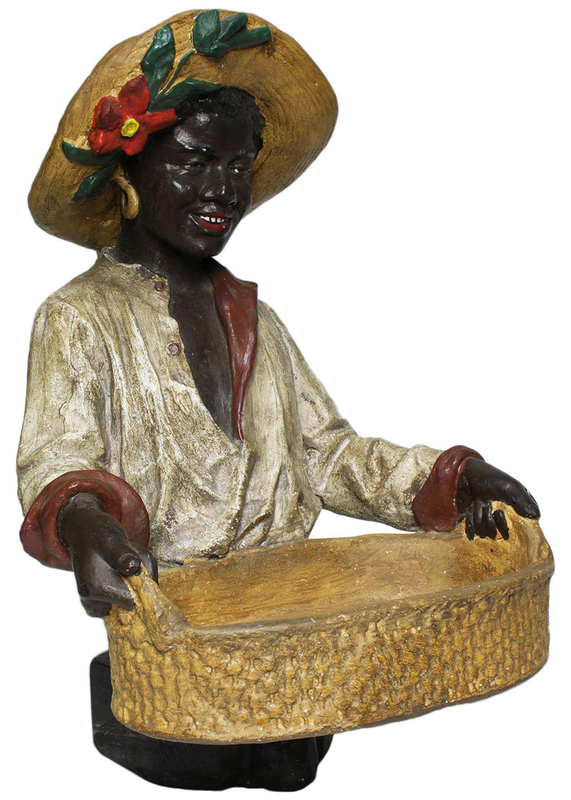 An Austrian Early 20th Century Cast Bust Figure of an African Girl Holding a Tray. The smiling young girl wearing a straw hat decorated with a flower and leaves, holding weaved-wicker-like tray, probably by Goldscheider's Porzellan-Manufactur und Majolica-Fabrik. Circa: Vienna, 1900. The Goldscheider Manufactory and Majolica Factory (German: Goldscheider'sche Porzellan-Manufactur und Majolica-Fabrik, (now) Goldscheider Keramik) is an Austrian ceramic manufactory. In 1885, Friedrich Goldscheider came from the small Bohemian city of Pilsen to Vienna and founded the Goldscheider Manufactory and Majolica Factory. It became one of the most influential ceramic manufactories of terracotta, faience and bronze objects in Austria with subsidiaries in Paris, Leipzig and Florence. For over half a century Goldscheider created masterpieces of historical revivalism, Art Nouveau (Jugendstil) and Art Deco. Famous artists such as Josef Lorenzl, Stefan Dakon, Ida Meisinger and the two perhaps best known Austrian ceramic artists Michael Powolny and Vally Wieselthier worked for Goldscheider. Several of the artists who worked for Goldscheider also worked for other Viennese studios, such as Augarten, Keramos or for the German brands Rosenthal and Meissen. 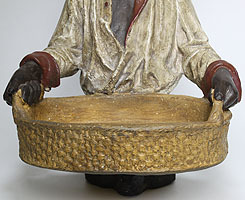 An Austrian Early 20th Century Cast Bust Figure of an African Girl Holding a Tray. 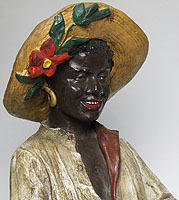 The smiling young girl wearing a straw hat decorated with a flower and leaves, holding weaved-wicker-like tray, probably by Goldscheider's Porzellan-Manufactur und Majolica-Fabrik. Circa: Vienna, 1900. The Goldscheider Manufactory and Majolica Factory (German: Goldscheider'sche Porzellan-Manufactur und Majolica-Fabrik, (now) Goldscheider Keramik) is an Austrian ceramic manufactory. In 1885, Friedrich Goldscheider came from the small Bohemian city of Pilsen to Vienna and founded the Goldscheider Manufactory and Majolica Factory. It became one of the most influential ceramic manufactories of terracotta, faience and bronze objects in Austria with subsidiaries in Paris, Leipzig and Florence. For over half a century Goldscheider created masterpieces of historical revivalism, Art Nouveau (Jugendstil) and Art Deco. Famous artists such as Josef Lorenzl, Stefan Dakon, Ida Meisinger and the two perhaps best known Austrian ceramic artists Michael Powolny and Vally Wieselthier worked for Goldscheider. Several of the artists who worked for Goldscheider also worked for other Viennese studios, such as Augarten, Keramos or for the German brands Rosenthal and Meissen. The Goldscheider family emigrated in 1938 to United Kingdom and USA. Walter Goldscheider startet a new factory in Trenton, New Jersey and returned to Vienna in 1950. Marcel Goldscheider went to Stoke-on-Trent and produced figurative ceramics for Myott and opened his own studio in the 1950s in Hanley. Both brothers died in the early 1960s. More than 10,000 different models were created over a period of three generations. Since the very beginning many of these won first prizes and gold medals at innumerable world fairs, exhibitions and trade fairs. Goldscheider figures are nowadays very much sought after by collectors worldwide and reach astonishing prices at auction houses around the world. Several exhibitions and lectures took place since the new book on Goldscheider was presented in 2007 to the public: a big Goldscheider exhibition was shown at the Vienna Museum (November 2007 – February 2008), at the LBI in New York (Jan. – Apr. 2009) as well as lectures in Prague at the Museum of Decorative arts (June 2008) and at the 10th Worldwide Art Deco Congress in Montreal (May 2009). From June till October 2015 the Grassi Museum honoured the history of Goldscheider in Leipzig with an amazing exhibition. Current exhibitions are usually shown at the official Goldscheider website.